After President Trump yanked funding for Speaker Nancy Pelosi's (D., Calif.) Democratic delegation trip to Afghanistan, a trio of GOP senators are pushing a proposal that would bar any congressional travel if Congress can't meet its budget deadlines. The bill would also prevent Congress from leaving Washington if lawmakers fail to complete their job of funding the government on time in an effort to fix the broken budget process and avoid future government shutdowns, stop-gap funding extensions, and bloated, last-minute, "omnibus" spending deals. "We are on day 26 of the longest-ever government shutdown, and yet Congress is about to go home for the weekend, with some members flying out of the country," Sen. James Lankford (R., Okla.), who is pressing the idea, along with Sens. David Perdue (R., Ga.) and Joni Ernst (R., Iowa), said yesterday. "The proposal that we offer today would keep Congress in town until the budget is finally resolved." 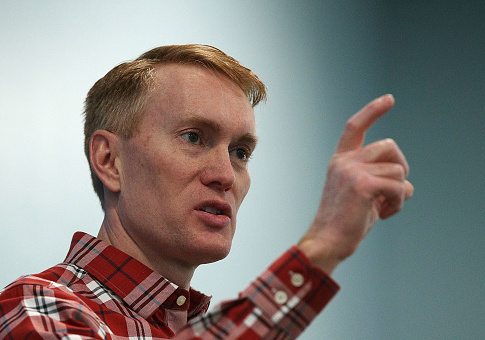 "During a government shutdown, Congress and the White House should experience pain, not the American people," Lankford added. Conservative senators had expressed deep concern about Senate Majority Leader Mitch McConnell's (R., Ky.) original plans to let senators leave town next week, when the government shutdown passes the 30-day mark, while the House remains in session and hundreds of thousands of furloughed government workers remain in limbo. McConnell on Tuesday said the chamber would not leave for next week's recess unless the government reopened. With so much scrutiny of Congressional travel in recent weeks, conservatives also are uneasy about senators leaving even for this weekend. Perdue and Lankford were behind a successful effort last year to press McConnell to take a more confrontational approach with Democrats in order to confirm Trump's nominees and pass spending bills. They successfully persuaded McConnell to delay the August recess by two weeks to press the Senate and recalcitrant Democrats off the campaign trail before the midterms elections and into action approving a raft of nominees. "Congress should be held to the same standards of people in the real world," said Perdue. "Washington's broken funding process has created a dysfunctional cycle of continuing resolutions, last-minute spending deals and government shutdowns. Enough is enough." The senators want to tamp down increasingly vitriolic high-stakes budget showdowns and create what they are calling a "politically neutral platform" to fund the government on time every year. There will be "real consequences" for members of Congress if they don't get their most basic job of funding the government done, Perdue said. "We should not go home until we have completed our work. Period," Perdue added. Congress's deadline for passing all spending the bill is Oct. 1, the first day of the new fiscal year. However, since 1976, Congress has only funded the government on time four times, the senators point out. Instead of wrapping up the work on time, Congress has relied on temporary funding extensions called "continuing resolutions," which are wasteful and create uncertainty. They also lead to impasses: There have been 21 government shutdowns since 1976, costing billions in retroactive pay and lost economic output. The last time Congress funded the government on time was 1996, more than 20 years ago, and it passed a budget resolution only 11 times in the past 20 years. The broken budget process inevitably leads to wasteful spending as the appropriations process is dragged out and lawmakers infuse it with spending "sweeteners" to cut deals, instead of forcing painful deadlines. The U.S. is nearly $22 trillion in debt, with the budget deficit projected to exceed $1 trillion in the coming years, the senators point out. Looking at the Department of Defense alone, the reliance on continuing resolutions has forced the Pentagon to ground or underfund dozens of programs, resulting in $4 billion in waste for the Navy since 2011, the senators argue. Perdue, Ernst, and Lankford aim change the dynamic by requiring lawmakers to stay put if they have not approved a budget by April 15 and passed all appropriations bills by Aug. 1. If Congress misses those two deadlines, it would not be able to adjourn for more than eight hours, no funds would be available for official travel back to their districts or states, or on overseas trips such as the one Pelosi planned and Trump canceled to Afghanistan. To ensure that members of Congress can't leave Washington, both the House and Senate would hold two quorum calls—essentially a head-count check-in—per day that would force lawmakers to show up and remain within a close distance to the Capitol. "This dysfunctional cycle is not the way our government was designed to function or should function," Ernst said. "If we fail to pass a budget and spending bills, we should stay in town and work together until we get the job done." This entry was posted in Politics and tagged Federal Budget, Government Shutdown, Government Spending. Bookmark the permalink.